Purest Porridge Oats? These oats are as pure as can be. Normally oats are steamed before being turned into flakes, but Rude Health`s sprouted oats are simply rolled - that`s it. This means that the flavour is more oaty and complex, the texture is creamy but with a delicious bite. Why sprout? What`s more nourishing than a grain? One that`s been sprouted. Dormant food - An unsprouted grain is dormant, waiting for the right time to germinate. Its nutrients are locked up and well protected, making dormant grains harder to digest. Sprouting? When soaked in water, the grain wakes up and starts to sprout. Enzyme activity breaks down growth inhibitors, transforming and multiplying nutrients into their more easily digestible forms. Bring to the boil and simmer for 12-15 minutes until most of the water has cooked down, stirring occasionally. Pour the oats and half of the liquid into a bowl. Cook on full power for 2 minutes then stir. Add half the remaining liquid, cook for 1 minute then stir. Add the rest of the liquid, cook for 1 minute then stir and leave to cool and thicken for a minute. 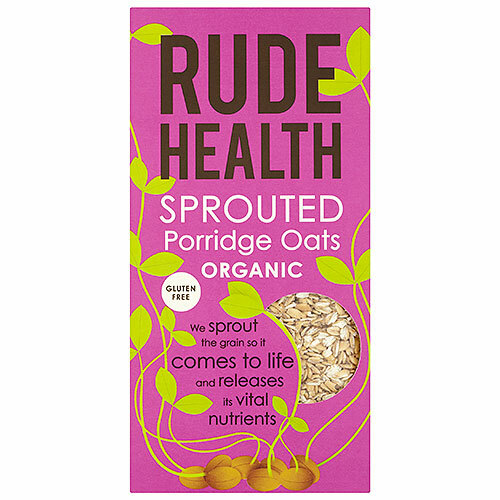 Below are reviews of Rude Health Sprouted Porridge Oats - Organic - 500g by bodykind customers. If you have tried this product we'd love to hear what you think so please leave a review. Purest Porridge Oats? These oats are as pure as can be. 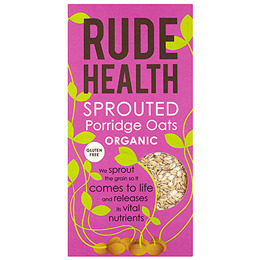 Normally oats are steamed before being turned into flakes, but Rude Health`s sprouted oats are simply rolled - that`s it.